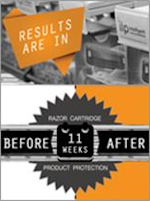 In a recent store test, one U.S. retailer discovered that the OPEN Merchandising System significantly reduced theft and increased sales of razor cartridges. Just how much change occurred over the 11-week period? Prior to the installation of the OPEN Merchandising System, the retailer was selling an average of 16 units per week and losing 14 units per week to theft. 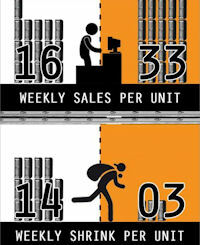 After 11 weeks, the average sales were 33 units per week and average loses to theft were 3 units per week. This is a 106% increase in sales and a 79% reduction in shrink! Check out the infographic here for a quick overview of the test. How does the OPEN Merchandising System work? It is essentially a product facing system that detects product movement and sends notification in the event of sweep. By allowing honest shoppers to access products in an open-sell environment that is monitored with integrated security, the “sell more/lose less” ideal can actually be achieved. While these figures indicate a strong shrink reduction and sales increase for the razor category, OPEN is ideal for a number of small, high-theft products such as medicines, skincare, small electronics, fragrances and much more. OPEN is available in shelved or pegged formats and typically involves a retrofit of your existing fixture. What type of merchandise do you currently keep behind the counter, in a locked case, or hidden behind bulky EAS devices? Or, perhaps you have unprotected merchandise that’s falling into the wrong hands. What categories are lagging in profitability due to losses or stagnant sales? Consider a simple test of the OPEN System in an underperforming category and discover what kind of results you can achieve. Click here to watch the video or to sign up to test the OPEN System in your store.